Two Ohio State faculty from the Department of Electrical and Computer Engineering have earned five-year, $500,000 Faculty Early Career Development (CAREER) Awards from the National Science Foundation. Assistant Professors Vanessa Chen and Nima Ghalichechian received the prestigious awards, which support junior faculty who exemplify the role of teacher-scholars through outstanding research, excellent education and the integration of both. Vanessa ChenChen’s award will provide funding for her research in real-time machine learning and cybersecurity. Her project “Bio-Inspired Sensory Interfaces Incorporating Embedded Classification and Encryption” aims to convert data into meaningful information and protect it from cyberattacks in real time. The motivation to provide such real-time security within every smart device, she said, is because each one is under threat of malicious attacks by transmitting unencrypted data. Applications sending steady information for continuous health or weather monitoring, for example, are particularly vulnerable. An attacker could record the confidential and private information or change the results to broadcast a fake national disaster alert. The technological drawback is the energy required to perform complex machine learning and encryption algorithms. 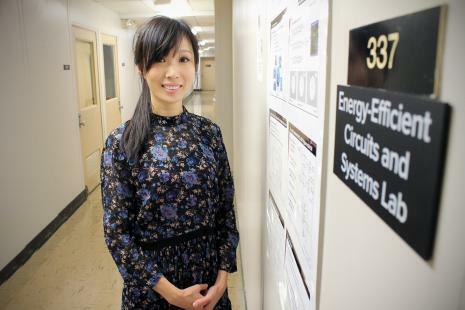 Chen is working to develop an energy-efficient circuit architecture to embed into energy-constrained edge devices, performing classification and encryption. 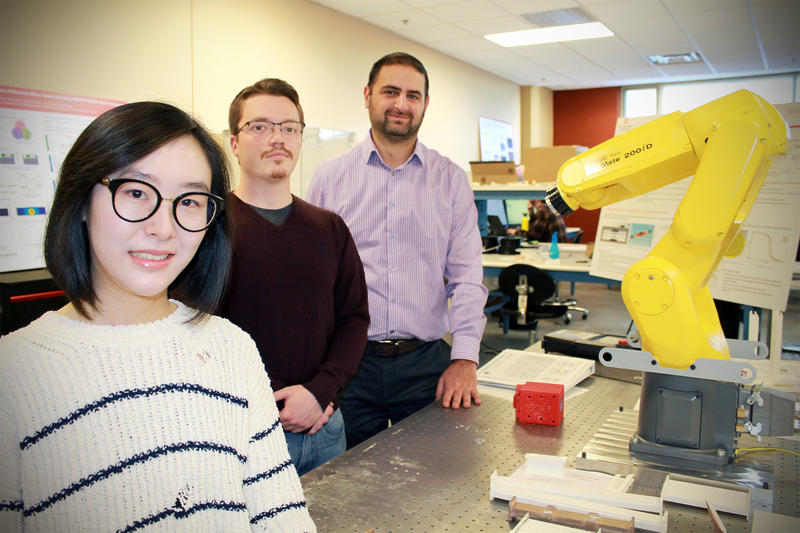 Nima Ghalichechian (right) with grad students Shangyi Chen (left) and Mark Lust (center).Ghalichechian’s award will support his work on a new generation of radio frequency devices capable of advancing space communications, smart phones and even self-driving cars. His project “Understanding and Exploiting Non-linear Behavior of Phase-Change Materials for Millimeter-Wave Applications” marries the concepts behind materials engineering and electromagnetics. His team is performing fundamental studies on phase-change materials and their applications in the millimeter-wave domain, specifically to create passive imaging sensors. Applications of this research could advance medical imaging, navigation, remote sensing, and robotics, to name a few. The work is interdisciplinary and centers upon using novel material properties to address the ongoing limitations of current millimeter-wave devices, Ghalichechian said, such as sensors and antennas. Ghalichechian previously won NSF funding for his work on creating efficient integrated circuit antenna arrays.